As part of the Bowers Group, Baty International Ltd has supplied CTPE Ltd with a Baty R14 FT-2E profile projector to ensure the accuracy of complex machined components used for scientific and medical applications. Based in Mildenhall, Suffolk, CTPE Ltd manufactures a variety of turned and milled components, ranging from simplistic to complex parts. The vast majority of parts are small sized, and many are used in medical diagnostic equipment such as blood gas analysers, and in specialist scientific instruments for laboratories. CTPE required an accurate and repeatable measurement method that would enable the business to measure features on components that they were unable to measure with hand measuring instruments such as micrometres and calipers. CTPE needed to measure complex radius profiles on turned parts, and features such as blended radiuses and angles, which are impossible to measure with traditional hand measuring equipment. A more sophisticated method of measurement was needed, as many of the parts manufactured have extremely tight tolerances. Bowers Group supplied CTPE with a Baty R14 FT-2E profile projector in order to improve its machining accuracy and quality inspection capability for complex machined components. CTPE’s CNC setters and operators now use the machine to perform first article inspections, and the Operations Manager regularly uses the profile projector for final inspection of components, ensuring precise consistency and the highest quality product. Bowers Group also supplied CTPE with Fusion software with a touch screen monitor for use on the profile projector. The Fusion metrology software enables CTPE to produce accurate inspection reports at the touch of a button, automatically saving all relevant data from inspections. With over 25 years’ experience providing subcontract CNC machining, CTPE Ltd has built a reputation of manufacturing high quality, precision components to industry leading companies. Established in 1989 as a precision engineering company offering prototypes and small batches, CTPE has grown to become a leading sub-contract supplier for machined components to the Scientific and Medical industries. The most important thing on CTPE’s list of priorities is quality, with the company being fully committed to continuous investment in the latest in CNC manufacturing technology, ensuring the ability to provide a complete solution for the supply of high quality components. 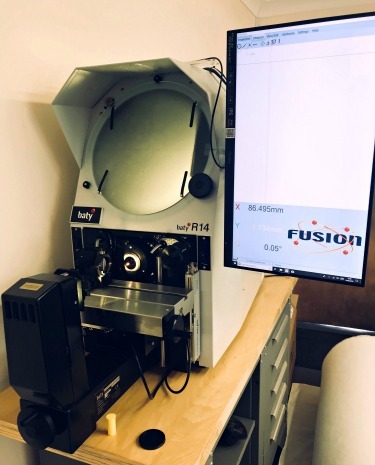 The Baty R14 FT-2E is a bench mount profile projector with a 340mm screen, combining high accuracy non-contact measurement and inspection with a large 175mm x 100mm measuring range. Its horizontal light path configuration is ideally suited to machined parts, and the compact and robust lightweight chassis makes the R14 ideal for workshop environments.